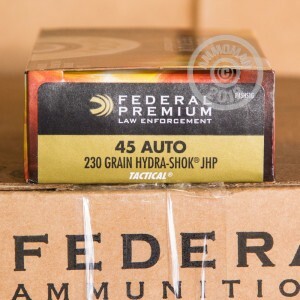 Federal Hydra-Shok ammunition is a proven self-defense product designed around the Hydra-Shok jacketed hollow point bullet and its distinctive center post, which helps the round get just the right amount of expansion and penetration in targets. 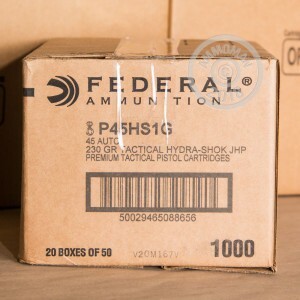 This case of 1,000 Hydra-Shok rounds, packaged in 20 boxes of 50, will serve well for personal protection in .45 ACP firearms including 1911s, Smith & Wesson M&Ps, Sig P220s, and FNP 45s. These rounds use a 230 grain projectile, which produces average velocities and a relatively low risk of overpenetration in a self-defense situation. The standard pressure loading of this ammo trades a small amount of power for reduced recoil and firearm wear and is suitable for use in all .45 Auto pistols. This ammunition uses non-corrosive Boxer primers and reloadable nickel-plated brass cases. 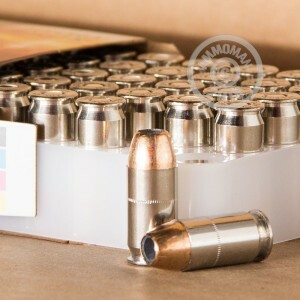 Buy ammo by the case (or in any quantity that gets you over a $99 order total) to qualify for free shipping from AmmoMan.com. This offer applies no matter how big your shipment is, so stock up and save!